I recently read an article about Frownies Facial Patches. And they are magic. Apparently, the idea behind them has been around for centuries, yet they continue to fly under the radar. Essentially, these are small patches with an adhesive that you apply to your wrinkles before bed. You use them nightly, and after a few weeks of use, your wrinkles are reduced or even gone altogether. If you are anything like me, you are probably thinking, yeah right. But I did my research, and these little patches are legit. First of all, it only costs $19.95 for 144 patches on Amazon. I will take that cost over Botox anyday. Plus they are vegan and cruelty-free… SCORE! But, how do these work? Well, after completing your skincare regime and letting your moisturizer absorb so the adhesive sticks, you apply these wherever. I have a massive wrinkle between my brows, so I would choose there. But maybe you have laugh lines or fine lines someplace else. You simply sleep with them on and remove them upon rising. You will immediately notice a temporary tightening in your skin and after a few weeks the results will stick around. What they actually do is train your facial muscles over time, so they are relaxed and not so tensed. Don’t believe me? Just check out the before and afters in the Amazon reviews section and you will surely be convinced. It is like night and day, or perhaps a better analogy is your front facing camera vs. Facetune. There are no harsh chemicals, no needles, and no-nonsense. Okay, okay… this might not be all that surprising. I am sure you know all about Jade Rollers. And if you haven’t, you have at least seen them in a blogger’s Instagram post once or twice. I spent months rolling my eyes at these aesthetically pleasing gadgets before actually picking one up. I ordered mine from Amazon for under $15 and WOW! Not only is this tool adorable, but it actually works. Rolling this cooling stone in an upwards motion somehow depuffs your skin, and improves circulation immediately. Over time, I’ve even noticed a reduction in some of my fine lines and crow’s feet. 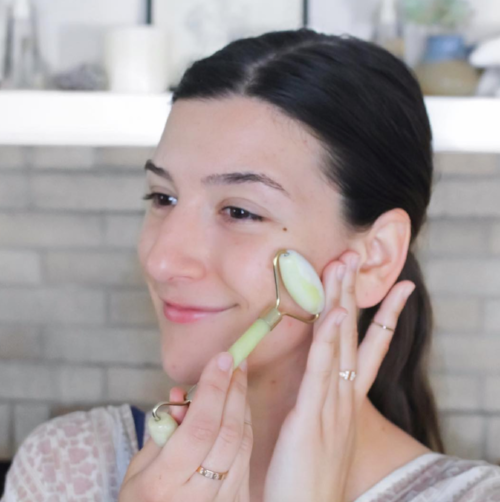 Along with the visible benefits of using a jade roller, it just feels insanely relaxing. In the AM it wakes you up. Try putting it in the fridge overnight, and that sensation will be amplified. Then before bed, it is such a pampering step. You can find jade rollers at all different price points, but from my experience, you don’t have to invest heavily, just read the reviews before buying for quality purposes. The BeautyBlender is nothing new and neither are these snazzy oil absorbing tools, yet the BeautyBlender Blotterazzi Blotting Sponges are not raved about as much as they should be. Carrying a beauty blender around with you is not only unhygienic but also a hassle, instead, these blotting sponges come two to a pack, and are housed in this handy mirrored compact for on-the-go touch-ups. If you hate carrying a powder and a brush, and find blotting papers to only work up until a point, these are ideal for you. The sponges are reusable, latex-free, and truly absorb unwanted shine. Powders can leave you dry and cakey, but this won’t disrupt your makeup and will get rid of the oils for a flawless look. This may just be my personal favorite of the bunch. Some people say this is the material Mulan’s sleeve was made of, because it works so well to remove ALL your makeup. The Makeup Eraser is essentially a makeup removing towel. Sounds dull, right? Well, it is anything but. At only $20 this gadget can be washed and reused at least 1,000 times. It is chemical-free yet removes all makeup, even the waterproof varieties. It comes in multiple colors, is insanely soft, and truly works. Forget about picking up expensive makeup wipes that can be bad for the environment, or repurchasing your cleansing oil, just add water and this baby will remove it all. I recommend picking up a couple so you always have one on standby while the other is being washed. I don’t know how people are not screaming about this product from the rooftops. 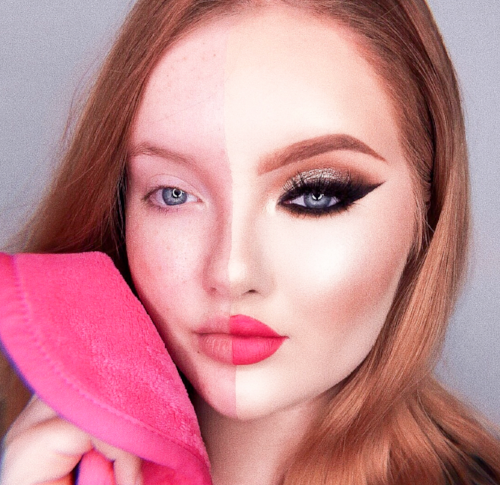 The Makeup Eraser is unbeatable in the makeup removing game. Have you tried these beauty gadgets already? Leave a comment below!